German Pinschers are completely devoted dogs. They adore their family and love to be company to their family members no matter what they are doing. They are extremely lively, tenacious, and brave. Often times, it is on the lookout of its property with the goal to protect its home and its family. On an everyday basis, this breed doesn’t bark continuously, but if an intruder comes close to its home, the barking will begin and be very frivolous at that. It is an extremely quick learner, but typically doesn’t obey commands unless there is a good reason for it to obey. It usually has ulterior motives so it can be bribed easily with treats. This breed is very good with children, and loves to play. It can be very affectionate at times as well. However, if you get a group of German Pinschers in a room together, there may be arguments over which one is the leader. They also don’t get along well with small rodents, and sometimes even small pets. German Pinschers like to be involved in whatever is going on around them. They dislike it when they are left out of whatever event or daily happening is occurring. They especially dislike being confined to a kennel or boarded away for a week or so. This breed requires exercise every single day; not just exercise of the body, but also exercise of the mind. Both forms are super important to the breeds well-being. This can be done by taking your Pinscher on a hike, on a long walk, or a jog through your neighborhood. It also like to play games in a fenced in area. When it comes to grooming, there is only minimal brushing required, as this breed has very short hair that doesn’t tangle or knot up very easily. The main purpose for brushing this breed is to simply remove dead hair. Health concerns are fairly minimal when it comes to the German Pinscher. Overall, it is one of the healthiest dog breeds known today. There are no major or minor concerns that tend to circulate through this breed. This is most likely due to good genes through the development of the breed. There is not even a condition that would be considered occasionally seen. Although it is healthy, it is still suggested that you take your dog to get tested for hip and eye conditions, as every dog breed needs regular checkups to ensure good health. If kept healthy, this breed will live approximately 12 years of age to 15 years of age. The German Pinscher can actually be traced back to the seventh century! In the 1600s, they mixed Tanner dogs with Black and Tan Terriers, which produced the Rattenfanger. This dog was very watchful and versatile. 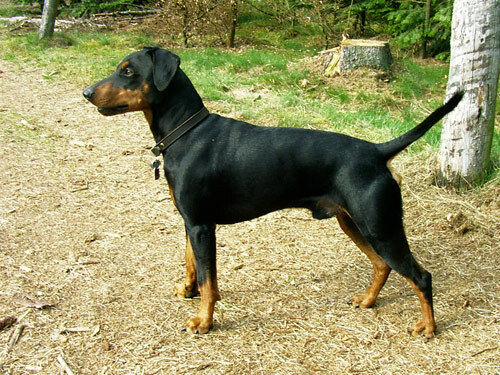 This ultimately led into the breed that is known today; the Pinscher. Fans of the breed weren’t immediate, however it did gain popularity over time. It actually was almost extinct by the world wars, but made a comeback soon after.